George Graham reviews The Public Opinion Afro Orchestra's "Naming and Blaming"
While styles of World Music tend to originate in one area and are usually associated with it, in this day and age of the Internet, the styles have no geographic boundaries, with genres associated closely associated with one area turning up in very different places. A good example is the Latin American influence of African soukous music or African rumba, or reggae bands arising on almost every continent. This week we have another transplanted style flourishing in a location rather distant from its origin. 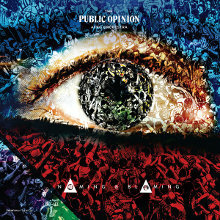 The band is called the Public Opinion Afro Orchestra, and they are from Melbourne, Australia. In the 1970s, the late Fela Kuti originated the Afro Beat style in Nigeria, with large ensembles with horns, and a distinctly African beat, and often with political lyrics, which got Kuti imprisoned numerous times by the regime in Nigeria. Over the years, Kuti became highly influential and attracted many well-known rock stars as fans. After his death in 1997, his musical legacy seemed only to grow, with his sons carrying on his music, and an off-Broadway biographical production. In the US, a number of groups have carried on Kuti’s Afrobeat sound, including Antibalas, and the Chicago AfroBeat Project. On the other side of the globe, in 2006, bassist Zvi Belling, multi-instrumentalist Tristan Ludowyk, and Ethan Hill, also known as DJ Manchild, formed an association in Melbourne, which would become the Public Opinion Afro Orchestra, which has grown to 17 members. Their new release Naming and Blaming is their second album, and the first to get much distribution in the US. The band maintains the key elements of the Fela Kuti style with the abundant horns, vintage electric keyboard sounds, the driving rhythms and modal tonalities that gave Kuti’s music its distinctive sound. The POAO, as they call themselves, also brings in social activism in their lyrics, with protest songs about inequality and corruption. Unlike Kuti’s music, the POAO features several different lead vocalists, some singing in the Fela style, and also with a rapper who goes by the name One Sixteenth. The POAO also can bring in some James Brown influenced funk at times. It’s also fun to hear music like this performed with an Australian accent on one of the tunes. The band features strong musicianship, though it definitely has the earthy sound of Afrobeat, with the horns perhaps not in absolutely perfect pitch, and the backing vocals having a similar sound more in the spirit than in musical precision. But the rhythmic grooves are first rate, and the energy level is stays high. Like much of Fela Kuti’s music, each track on Naming and Blaming is lengthy. There are only five tunes on the album with three of them running between 8 and 10 minutes. It gives lots of time for the grooves to develop, and key horn players get a chance to solo on most of the tracks. Often there are several minutes of instrumental buildup before the vocals enter. Naming and Blaming the new second album by the Public Opinion Afro Orchestra, from Melbourne, Australia, is another reminder that world beat music has no boundaries. This 17 piece band that was founded more than a dozen years ago, does an excellent job in keeping alive the spirit of the music of the late AfroBeat founder Fela Kuti. Though Kuti’s stylistic influence is strong, the band adds enough of their own ingredients to make it more interesting and to give the group a distinctive sound. Their energy level and musicianship is just right for this kind of groove based style, and it makes for music that is both danceable and that has something to say. Our grade four sound quality is, unfortunately, a C. The recording was badly over-compressed and over-driven to the point that the low frequencies are muddied and often distorted, and the heavy volume compression makes everything the same uniform volume, so the recording is dull and lifeless. Some 40 years after Fela Kuti was popularizing the AfroBeat sound in Nigeria, the style lives on with groups from around the world. The Public Opinion Afro Orchestra shows that the sound is also flourishing Down Under.